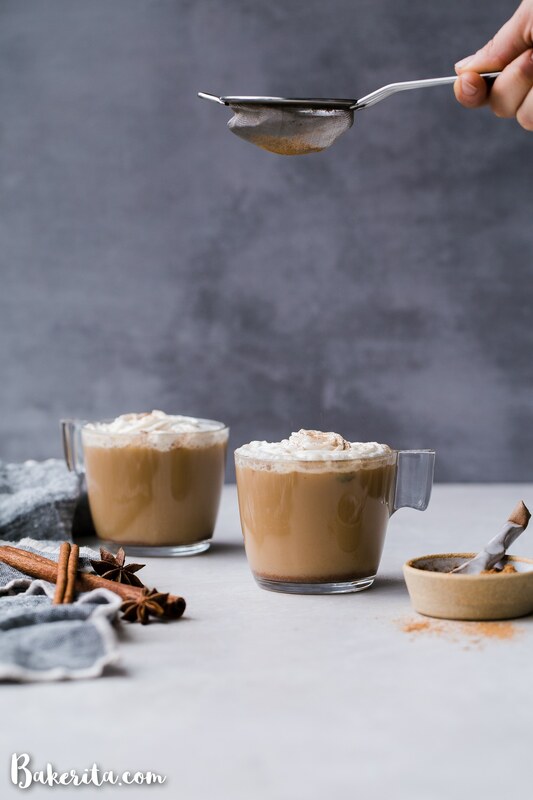 This spicy homemade Vegan Chai Latte is made with almond milk and sweetened naturally with maple syrup. The homemade chai spice mix is full of ginger, cinnamon, black pepper, and other warm spices. It’s the perfect drink for chillier days. So I have my mushroom coffee every morning, and to be real, I’m pretty addicted to it. But sometimes lately, I want a second warm drink of the day and don’t want to have more coffee. Also – it’s been getting straight up chilly in San Diego this last week or so. Allll of the warm drinks have been calling my name. 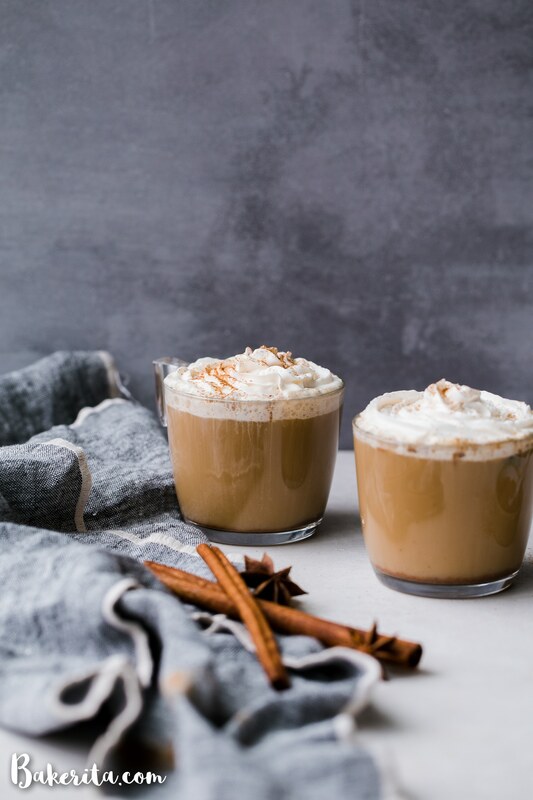 Enter: the vegan chai latte. It’s currently pouring and sipping on a hot drink is just about the dreamiest thing to do when it’s cold out and rainy out. Especially when warm spices make that drink extra warm and fuzzy. Bonus points for sipping your chai latte in front of a fire and/or wrapped in a cozy blanket. I’m slacking on the fireplace because, well, I live in San Diego. Having a fireplace is a rare commodity here, but you know I’ve got my blanket. 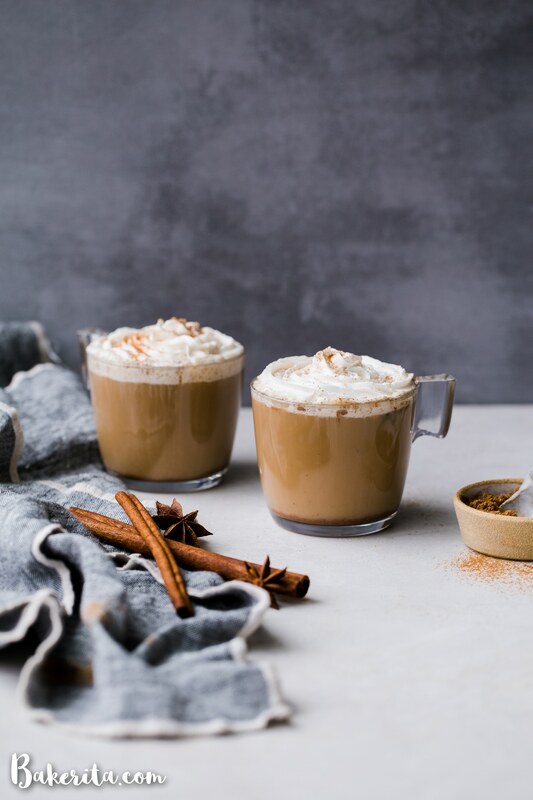 Let’s get to the Vegan Chai Latte – and the Chai Spice Mix! This recipe starts with a chai spice mix. The recipe provided makes a big batch, because who wants to have to measure out a whole bunch of spices every single time you want a chai? Instead, we make a big batch of the chai spice mix – enough for about 15 big lattes. 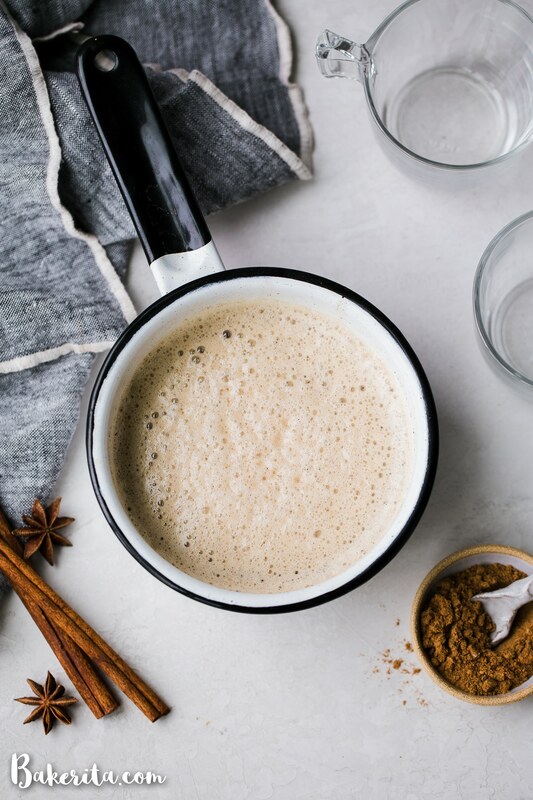 That way, making your vegan chai latte is as easy as heat (the milk), steep (the tea), and mix (the chai spice, milk, and sweetener). You can also use this mix to add into desserts, sprinkle in your coffee, or use in place of cinnamon for snickerdoodles…swoon. This homemade chai latte isn’t too sweet. But- it has a little kick from all the warm spices and is sure to warm you right up. I used about a tablespoon of maple syrup to sweeten, but that’s up to your taste buds. Now hurry on and go make your own vegan chai latte! Let the warm spices linger on your tongue and enjoy every warm sip. 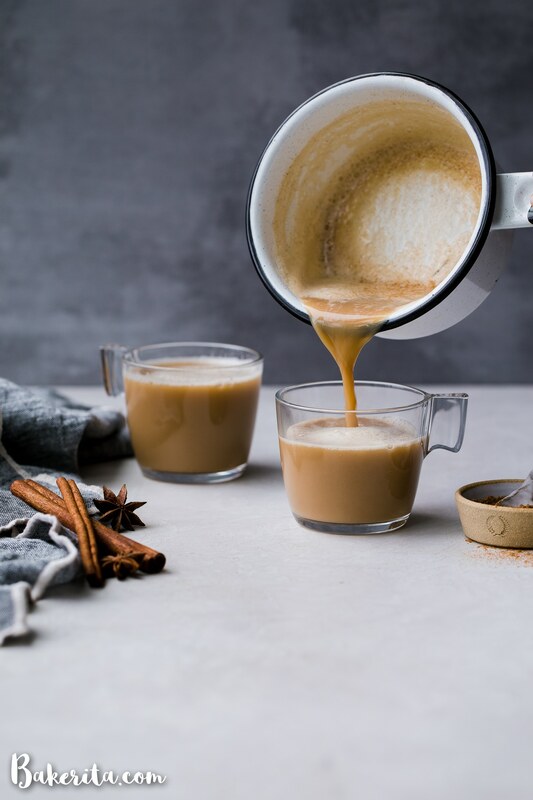 This spicy homemade Vegan Chai Latte is made with almond milk and sweetened naturally with maple syrup. The homemade chai spice mix is full of ginger, cinnamon, black pepper, and other warm spices. It's the perfect drink for chillier days. In a small bowl, whisk together all of the spices until fully incorporated. Transfer to a spice jar. In a small saucepan, heat the almond milk until scalding. Turn off the heat and add the black tea bags, let steep for about 5 minutes and then remove the tea bags. Add 1 teaspoon of the chai spice mix and 1-2 tablespoons maple syrup and whisk to combine. Taste, and add more spice/maple syrup as desired. You can also transfer the mixture to a blender and blend to combine, which will add some foam, or mix with a hand frother. Serve in one or two mugs, topped with some dairy-free whipped cream and a dusting of chai spice mix, if desired! To make a “dirty” chai: use half almond milk and half coffee, or add a packet of Four Sigmatic Mushroom Coffee to the latte. Does it have to be regular black tea or a specific type of black tea? Any kind you like is fine, I used plain black tea.